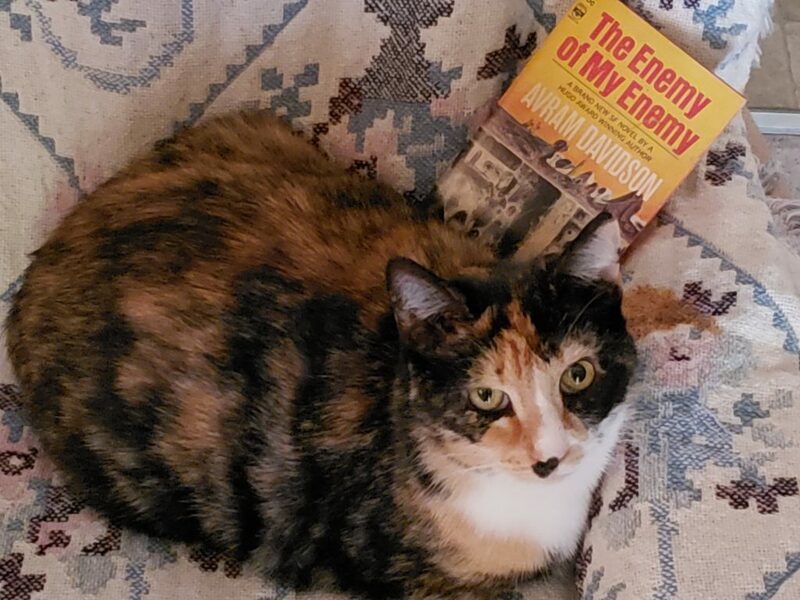 This entry was posted in Cats Sleep on SFF and tagged Avram Davidson, Lela E. Buis by Mike Glyer. Bookmark the permalink. Guarding the book, making sure suspicious camera will not hurt it. Aw, I had a calico kitty like that. Quite mad, but gorgeous. I am not typically one to quarrel with Lela Buis, but a cat named Spot? Surely you of all people can appreciate Lela’s contrarian streak? One of my two felines, Freya, is a calico though she leans more towards the brown over the orange. Saturday while I’m still here, my whole apartment is getting cleaned which is not something that they’ve encountered in about a year. I look toward to Dee who’s doing it telling me about how they behave. I also have a cat named Spot. Mine is a tabby. And, of course, Data also had a tabby cat named Spot. But that actually wasn’t where mine got his name from. I completely forgot about Data’s. But still, cats deserve dignified names. I had a gerbil called Jelly, a rat called Thomas, and a mouse called Badger. I think pets get the names which suit them*, it doesn’t matter what kind of name. She looks very much like a Spot to me. *Although my sister once had a murderous hamster with a very innocuous name, and not even with any appropriate appellation like “the Ripper” added to it, so there are limitations. I think pets get the names which suit them*, it doesn’t matter what kind of name. That’s true. We had a box turtle named Ivan the Terribly Hungry. We’d go out to their enclosure, find no visible turkles, and within a minute or so, he’d be digging out of the hole he’d made, wanting to be fed. (He showed up in a yard across the street. The kids who lived there brought him over to us, because they discovered that box turtles don’t do well with pools deeper than their shells.) …I miss the turtles. They were good for spending a while sitting in the sun, watching them – and sometimes they watched back. The first family cat I remember was named Poochie. That was our second cat (actual name: Patches. Nickname: Poochie (because of how she looked as a kitten when she walked) or Dumb Cat (because she once tried to jump through a closed sliding door – the first time she did it, it was open). Now I’m reminded of the Emersons, who provided at least one of our cats from their ongoing (though never large) cat population. Chauncey had been called Queasy before they passed him to my sister, who named him Taylor Tamsel Chauncey Meadors Queasy Emerson Williams. @Kip Williams: “Stupid” was also the effective name of my partner’s first cat (acquired right after finishing college and moving out from the family that included a cat-sensitive sister). Not bold generally, but determined to see the other side of every door; he got out while partner’s apartment was undergoing renovations. We were on another continent (not going to try to live through that class of rehab); the friend who was supervising went through the neighborhood calling the cat, and claimed there were several large houses (occupied by job-lots of beefy males from the neighboring university) where 2-3 heads swiveled when she did so. I had a cat named Smudge once, who was mottled black and orange if I remember correctly. That was a long time ago, gosh, the late seventies, I think.